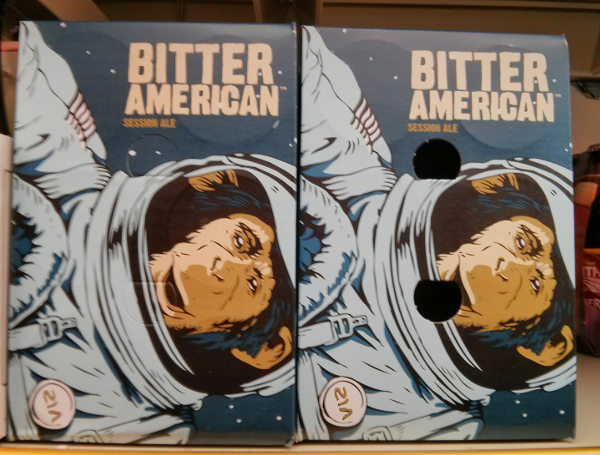 I was shopping for wine tonight and saw this package of ale. I liked the name and the reference to space history. This entry was posted in rambling and tagged ale, beer, bitter american, bitteramerican. Bookmark the permalink. I saw the reference to wine and went right to it. What does THAT say? Weird name for a wine for sure and kind of funny too. Makes me think of the movie Ugly American. Ruby Tuesday is one of my favorite places to eat salmon and I always get a glass of wine w/dinner. They offer, 5 oz or 9 oz. which is kind of nice. Now they offer a $10 bottle of Salmon Creek wine so, last time I went, I got the chardonnay. You have one drink, well I do anyway, or two for some, then they recork it and you take the bottle home. Cheaper in the long run, isn’t it? There is something annoying about where I live now. You cannot buy wine or any kind of liquor in the grocery stores. It is only sold in liquor stores separately. Of course, they are on every corner. Haha. And on Sunday, nothing is open till noon. It kinda seems like 1950. Not that I go shopping for wine on Sunday but it is so annoying having to make a special trip to get a bottle of wine after you have bought groceries. Especially when it is 15 below zero! I hate getting in and out of the car! I think I’m going to announce I’m not going to get the groceries again till it gets above 20 degrees. Some people just don’t know how that feels. The method in North Carolina is beer and wine can be sold in stores and markets, liquor has to be sold in state-run stores. That’s good enough. I know what you mean. I remember when I lived in Arizona, anything could be purchased at the supermarket. It was very convenient.